As many of you know, I have a thing for Shaun the Sheep. My SP11 pal (aka Hostie) has discovered this. Believe it or not, Hostie sat down and went back into the archives and read EVERY SINGLE post I've written!!!! WOW! (She wrote me to say that one of the other things she learned about me, besides my affection for Shaun, is that nobody messes with my Grandma!) Hostie turns out to be a close, personal friend of one of my idols...Shaun the Sheep. It seems Shaun is between films and is visiting Hostie in Japan. You can follow their adventures at the new Shaun in Japan blog. Totally cool! We are really enjoying reading about life in Japan! Check it out. Hostie also discovered that I tend to habitually occasionally knit socks. Before I discovered toe-up designs, where every inch of yarn could be used, there were leftovers. What to do with the leftovers? There have been suggestions, but now Mad Cow socks seem to be just the thing for my leftovers. Check these ones out. Though the examples are not shown with leftovers, I'm thinking that leftovers would be perfect! And finally, what's a bluebird to do? Isn't it funny how some people will get SO upset about something while others wonder why. In fact, I head on the news today that the area that adopted the bluebird is organizing a Bluebird Festival! 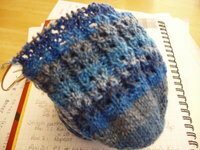 Progress on the new sock is great, even if my photograpy/camera skills are not. By the time I noticed that the photo was slightly out of focus, the sun had gone down. Speaking of daylight, how many of you have experienced odd occurances with your PDA calendars? This morning I noticed that KC's birthday was off by a day. I thought that was odd; how could I mess up my daughter's birthdate? Am I REALLY starting to lose it!?! Then I realized that some things were in the calendar correctly while others were moved to a day earlier. In the end, it turned out that my company applied the MS update for the new daylight savings time date over the weekend. In running that "patch", those of us who have Palms now needed to run the Palm "patch". For my Brit/Scot/Irish pals...lucky you...you get Shaun AND (hopefully) won't have to mess (much) with our country's decision to change Daylight Savings time to this coming weekend! Wallace & Gromit! It was SO exciting to see the boys from Aardman Studios take home the Oscar for Animated film. I was excited and a bit fearful for them. After all, they had a HUGE opening weekend in the US while back at home their studio burned to the ground. Just imagine what could go wrong after an Academy Award. Ahhh, but we won't think negatively. Good job boys. 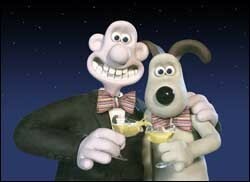 It has been a Wallace & Gromit weekend for me. 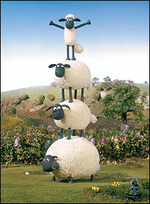 First, I won the Shaun the Sheep money bank and then today I won the Shaun the Sheep figurine on Ebay. I have one other item that I'm bidding on that you'll have to wait to hear about until tomorrow. I don't want to jinx it and I REALLY hope I win. When you see it, you'll know why I wanted it so badly. Hint: it's knitting related.